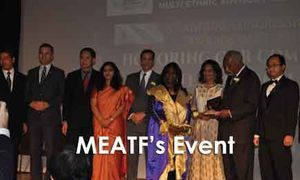 On October 28, 2018 US Congressman Danny K Davis & the Multi-Ethnic Advisory Task Force (MEATF) recently held the 8th Annual Congressional Awards Gala 2018. The event took place at the Meadows Club in Rolling Meadows. The evening started off with exceptional performances from various countries. Included in the line-up were the Russian Folk Dance Ensemble Lubava, Surya Dance Company from India, Tarana Kathak Dance Academy from Czech, Bosnian Dance Company, Indonesian Dance Troupe & the Polish Dance Ensemble. There was also a tribute to the late Michael Jackson to the delight of the crowd. Congressman Davis said that we should all work together in honoring cultural diversity & all religion in our communities.